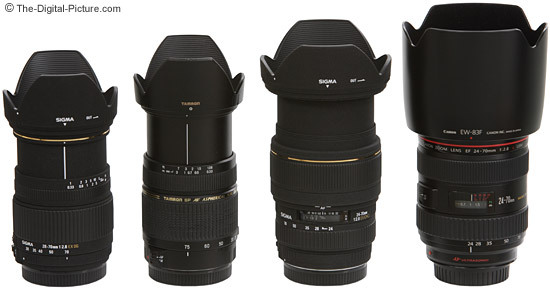 Note: The Sigma 28-70mm f/2.8 EX DG Lens has been replaced by the Sigma 24-70mm f/2.8 EX DG Lens. Like the Sigma 24-70mm f/2.8 EX DG Lens, the Sigma 28-70mm f/2.8 EX DG Lens is a well-built, well-spec'd lens with a value price. But, giving up 4mm of focal length range on the wide end results in a much more compact lens. 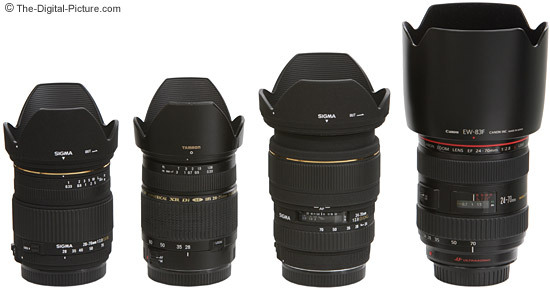 In addition, the 28-70 is priced noticeably lower than the Sigma 24-70. Pictured above from left to right are the Sigma 28-70mm f/2.8 EX DG Lens, Tamron SP 28-75mm F/2.8 XR Di Lens, Sigma 24-70mm f/2.8 EX DG Lens and Canon EF 24-70mm f/2.8 L USM Lens. The same lenses are shown fully extended below. The Sigma 28-70 is a solidly built lens. As it often does, solid translates to a rather heavy weight for the small size. Measuring a trim 2.9" x 3.4" (74 x 87.2mm), the 28-70 weighs 18.1 oz (510g). At 70mm, the lens barrel extends an additional 1" (23.4mm) or so. I really like the size and shape of this lens - It is comfortable to hold. I am not found of Sigma's matte finish and texture (a purely personal opinion), but most of this lens' barrel exterior is covered by the rubber-coated, smooth-operating, nicely-sized zoom and focus rings. Although the focus ring is smooth, I found just enough play in the ring to make manual focusing more difficult than it should be. I like the forward-positioned focus ring as I generally hold my lenses near the rear of the barrel - and don't want to accidentally change the focus setting or have the ring turn in my hand during autofocus. The Sigma 28-70mm f/2.8 EX DG Lens does not support full-time manual focusing - and the focus ring physically turns during autofocus. A distance window is not provided nor is necessary as the distance information is marked on the always-live focus ring. Autofocus is loud but reasonably fast - and is consistently accurate on stationary subjects. AI Servo performance on active subjects proved to be poor - with few keepable shots. Low light situations proved difficult for the 28-70 as well. As internal focusing is employed, the 28-70 does not extend during focusing. The Sigma 28-70 is very soft wide open - especially in the upper half of the focal length range. I don't consider the results useable at and above 50mm until the lens is stopped down to at least f/4 where the full frame corners are still soft. Performance at f/5.6 is better. This lens performs best at 28mm where the results are decent. CA (Chromatic Aberrations) are very well controlled, flare is not. Colors have a strong yellow cast to them - it is quite apparent when comparing photos from the Sigma 28-70mm f/2.8 EX DG Lens and a high-end lens such as the Canon EF 24-70mm f/2.8 L Lens. Moderate barrel distortion is present at the wide end and disappears by 40mm or so. Vignetting results are normal for lenses with specs similar to the 28-70 with full frame users noticing some corner darkening when shooting wide open. Like the Sigma 24-70, I find the Sigma 28-70 to overexpose by about .2 f-stops on average. The Sigma 28-70mm f/2.8 EX DG Lens features a fast, fixed 9-blade aperture ranging from f/2.8 to f/22. Again, you probably will want to avoid f/2.8 over most of the focal length range. A 67mm filter diameter keeps the Sigma 28-70's objective end reasonably small. Not many lenses share this filter diameter (the Canon EF 70-200mm f/4 L USM Lens is one of them), but filters of this diameter are not too expensive. Circular Polarizer filter users will appreciate the non-rotating front element which also allows the use of an ideally-shaped (petal) lens hood. Sigma's zoom ring turns the opposite direction from Canon's zoom lenses - neither is better unless you are very used to one direction or the other. A zoom lock switch locks the lens in the retracted position. This switch is not necessary unless this lens breaks in a great deal after use. Pictured above from left to right, the Sigma 28-70mm f/2.8 EX DG Lens, Tamron SP 28-75mm F/2.8 XR Di Lens, Sigma 24-70mm f/2.8 EX DG Lens and Canon EF 24-70mm f/2.8 L USM Lens are with lens hoods in place. The same lenses are shown extended below. With a minimum focusing distance of 13" (33 cm), the Sigma 28-70 has a maximum magnification of .23x. It will focus close enough for nice pictures of flowers and other similar-sized objects. The included small, plastic, inside-ribbed lens hood extends and retracts with the lens (like most lenses with this focal length range). There is not enough room for me to comfortably pinch the cap release when the hood is installed, but I am able to do so. This is a nuisance if you are installing/removing the cap with any frequency. A nice padded nylon lens case is also included. The Sigma 28-70mm f/2.8 EX DG Lens is available in Canon (reviewed), Pentax, Minolta, Nikon and Sigma mounts. Disclaimer: There are some potential issues with third party lenses. Since Sigma reverse engineers (vs. licenses) manufacturer AF routines, there is always the possibility that a new body might not support an older third party lens. There are examples of this happening in the past. Sometimes a lens can be rechipped to be made compatible, sometimes not. Second, there is the risk of a problem that results in the lens and body manufacturers pointing blame at each other. However, Sigma USA's 4-year warranty is far superior to Canon's standard 1 year warranty. Review update Nov 17, 2010: I just received an email from "Dan" with the following bad news: "I have this lens and it does not work with a canon XSi (back focuses). Sigma informs me that this is a ROM issue and cannot be fixed." 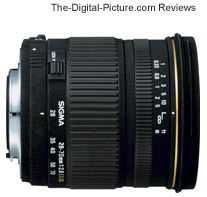 The Sigma 28-70mm f/2.8 EX DG Lens is a very well built lens for a reasonable price. Primarily due to mediocre image quality, I do not intend to include this lens in my Canon General Purpose Lens Recommendations. If you consider this an f/4 or f/5.6 lens, you *might* be happy with what you get for the price.